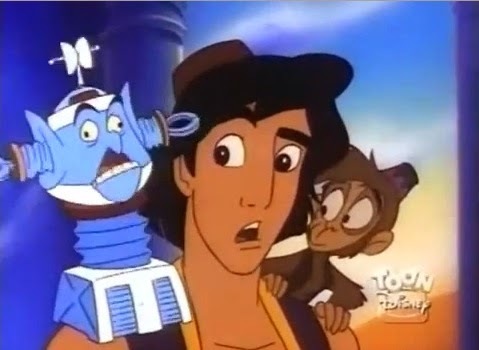 Aladdin is set in the distant past, right? A classical Arabian tale? 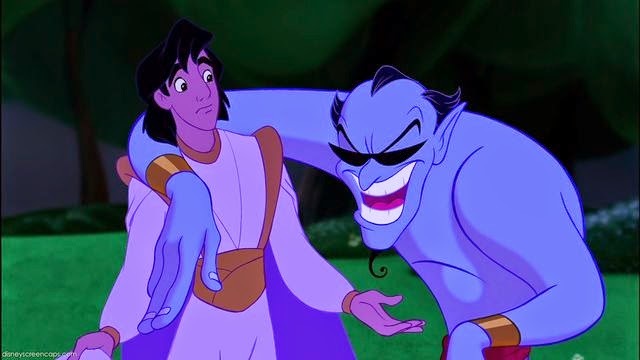 Genie tells Aladdin that his clothes are 'so third century', indicating that Genie has seen the year 299AD at the latest and regards it as a time in the past. Genie has been trapped in the lamp for 10,000 years. If the story was set around 300AD then Genie would not know about 3rd century fashion, having been trapped in the lamp during the period 200-299AD. He has been trapped in a lamp in a magic cave for 10,000 years and unable to monitor the outside world, thus the absolute earliest that Aladdin can take place is 10,300AD and probably further in the future. The genie knows of, and can do impressions of, various historical and fictional figures such as Julius Caesar, Don Quixote, Freud and Jack Nicholson. This indicates that Genie went into his 10,000 year imprisonment after the 20th century. The story is set in Agrabah. This is not a place that has ever existed in history... yet! Aladdin flies about on a magic carpet. Current technology does not allow for such advanced anti-gravity devices, and yet in this futuristic world it is barely that remarkable. Iago the parrot is clearly genetically modified or a cyborg, being capable of proper speech and displaying signs of sapience and human-level intelligence. Again, no-one notes this as unusual.